I often feel very robbed when journalists write articles under the banner of country roads, roads less often travelled or “heelpad grondpad”. You see, in my head, I started it all, its my concept! My I’ve been doing it for years, and simply love the less traveled back roads. I remember in 1995 when my firstborn was 2 months old; Heleen and I did a trip through the Groot Karoo of Britstown, Carnarvon, Williston and Calvinia. We camped at Algeria in the Cederberg and travelled through the Overberg and Klein Karoo. At that time I was traveling with a CLi Jetta and my ‘ventertjie’ was a Glider! Just outside Bredasdorp, at the Karsrivier, I turned onto the dirt road to De Hoop and Malgas, which I desperately wanted to see. However, here I realized that my equipment is not really suited for the road conditions. 70km of rock strewn dirt road with low profile tyres and towing the Glider with my wife and 2 month old baby on board suddenly made me doubt, and I reluctantly took the tar and crossed the Swartberg via the Tradouwspass to Barrydale. Spending a lovely night in Calitsdorp chatting with a du Plessis gentleman if I remember correctly, who was once a traveling journalist for the magazine “Panorama” I decided that the Jetta will just have to let me see the Swartberg Pass and that’s exactly what we did the next day. Fortunately without any hassles we saw the Swartberg, but once back in Pretoria I started searching for a more appropriate dirt road capable vehicle. And I found more than once that a “normal” dirt road would prefer a 4×4 rather than just a 4×2 or soft-roader. Ever since that trip, I loved to navigate these gem little back roads of South Africa and often do the back roads, simply because now I could! 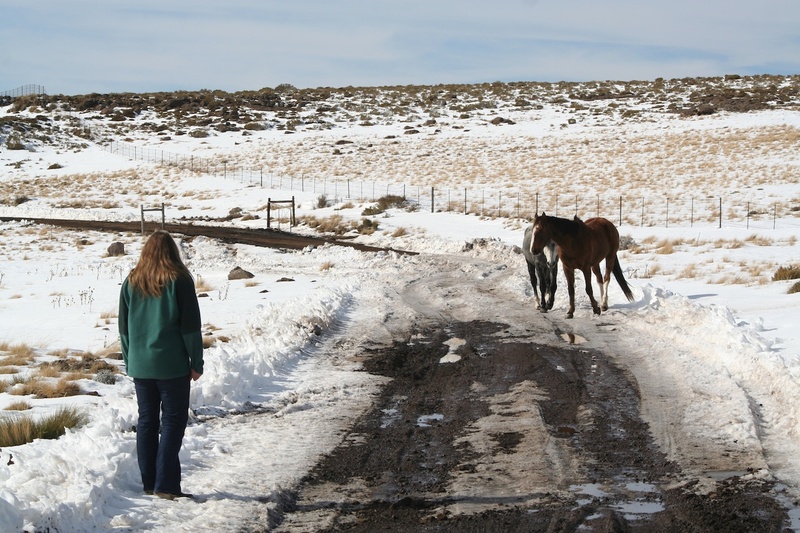 In 2009 we did a trip driving through a little bit of Eastern Free State with the destination being the New England Wartrail area in the Witteberge of the Eastern Cape. After picking up Heleen in Sandton at 5pm, on Wednesday, we headed south to Heilbron, where we temporarily got lost! Now this is some sort of funny phenomenon, that with a GPS, on a pre-determined route, on a road you have traveled before and sort of know, you can still doubt all the electronics and follow your own head. But I suppose it is a well known male thing and therefore consider myself excused. I wanted to do the dirt road not going over Petrus Steyn but since it was already dark and “we should have been home by now” (if I may quote Andrew Lloyd Webber and Meatloaf), plus I knew Dora was waiting in Rosendal at the guesthouse and thus couldn’t make up my mind immediately between dark and dirt or safer on tar. The S219 and S1296 had me on my preferred R725 towards Lindley in a flash and we were on our way again, just to be further delayed by the local farmer doing his “voorbrand” next to the road. The smoke was so intense and fire near the road that we waited 20 minutes before carefully passing with very limited visibility. Without further incident we reached Rosendal and fully took advantage of a hot bath and warm beds in the stunning House Beautiful (www.housebeautiful.co.za). Next morning, after a lengthy chat with one Mr Kriek, who simply stopped his car in the middle of the road next to me and started enquiring about me taking photos of the town and then telling me about the town, its NG Church with its 52 confirmed members, the grazing and weather of Rosendal in typical “platteland” hospitality and after a delicious breakfast we hit the scenic Maloti route towards Wartrail. 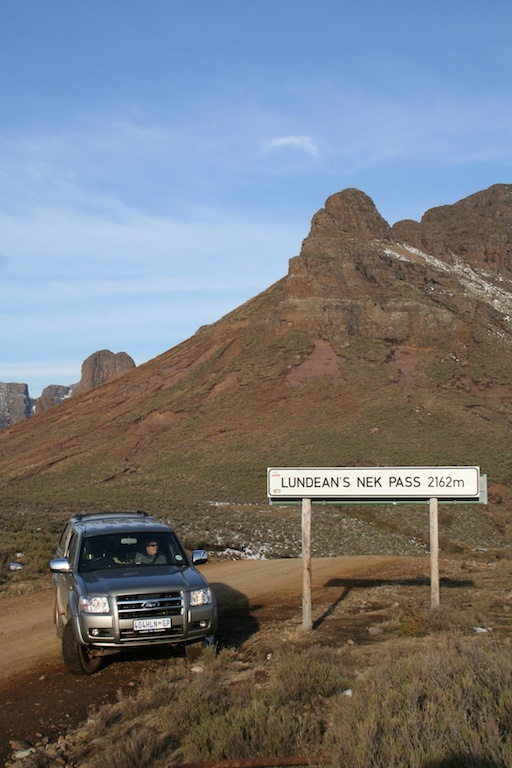 Since I was going to do the Lundin’s Neck pass, and didn’t want to do it in the dark, I stayed on the tar and simply enjoyed the scenic splendor of this stunning part of South Africa. I obviously did stop at the marvelous padstal outside Clocolan for biltong, koekies and jam, however. My route navigated us through the little towns Clocolan, Ladybrand, Hobhouse, Wepener, Van Stadensrus, Zastron and then south-eastwards towards Sterkspruit and Tellebridge. It is here that we again started the dirt road driving and what became such dramatic scenery that it urged me to write this trip report. It was now late afternoon, the mountains were speckled with snow and the mood was so terrific with the kids relating the bits of snow with their recent fortunate skiing trip in Italy. 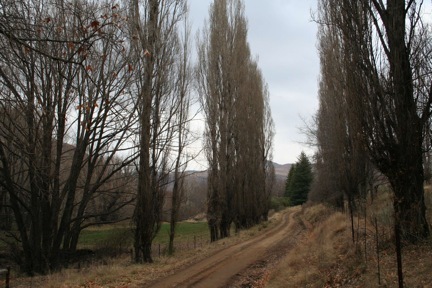 I know that our skiing areas and snow covered mountains can never be directly compared to the Italian Alps, or any part of the Alps for that matter, but I must emphasize that in South African context, this was absolutely magnificent scenery of scattered rural villages and friendly people in severe cold conditions surrounded by stunning scenery and covered in patches of snow, nogal! It was what I planned the weekend for, and it turned out to promise exactly what I hopefully anticipated. T.V. Bulpin described this as “one of the most spectacular scenic roads in Southern Africa. It is gravel throughout with tremendous gradients, and there is no pleasure in doing it in wet weather. But in fair weather, in summer or when the mountains are covered in snow, it is a dramatic experience”. Though Bulpin wrote these words in 1970 it is still 100% applicable, and we did it with the mountains covered in snow. During our abovementioned Italian ski trip, we incidentally became friends with the grandson of one Joseph Orpen, who still farms the family farm in these parts. Joseph was the surveyor who laid out the district in 1864 and who named them meticulously from the gazetteer from the UK resulting in names such as Snowdon, Balloch, Rosstrevor, Avoca, Faskally, Pitlochrie, Ben Macdui and Ben Nevis, even with the scenery being so magnificently African. 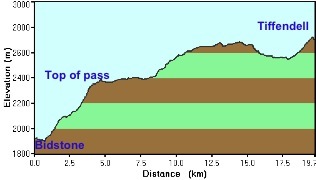 Our accommodation was Bidstone (http://www.wartrail.co.za/bidstone.htm) on the “Wartrail unpaved route” ala mapsource. It is the farming property of Andrew and Janet Viedge who provides very good, comfortable and scenic accommodation on a dinner, bed and breakfast basis. The dinner part of it is so necessary due to the remoteness of the venue. It is also the dinner part which added so much to experience and enjoying of the four nights we spent with them. It is here, around the dinner table, where you chat the night through with Andrew and Janet, and other guests if there are any, while really digging into Janet’s three course dinners. Warm and delicious soups, bolognaise, mutton bredies, lamb shoulder and the likes were on the menu and ensured for excellent dining every night. And not to mention the deserts afterwards. The thing about this format of accommodation is that you make great new friends. So was the hospitality that Andrew volunteered to show us the double caves on a neighbor’s farm. In the end, he spent most of his Sunday entertaining us on a magnificent walk/climb through the thick grass, on steep inclines and over slippery iced rocks to show us these caves. Besides the affect of the unexpected exercise on my unfit family, it turned out to be one of the highlights. Towering sandstone cliffs, caves and the Joggomspruit down below while a couple of fish eagles glides leisurely on the thermals completed the majestic creation around us. What a beautiful and serene setting. So much has the new friendship grown in just a weekend that my 11 year old son abandoned us, his family, for the rest of the day to go with Andrew and his family to look at newly found dinosaur fossils on a neighboring farm and have lunch with them. The interesting railway linking Barkly East with Lady Grey to the northwest is also in the area. Because of the mountainous landscape, a system of eight “reverses” was incorporated into the line, which has an incline of 1 in 36. I once read that its one of only two in the world using these reverses, the other being in Peru. This fact needs clarification though. My personal other highlight of the weekend away was obviously that I had the opportunity to drive the Bidstone Pass up and down with plenty of snow, ice and mud ensuring little adrenaline rushes. I have to state though, and not for the sake of being mucho, but more since I was the driver and thus experiencing the Forkie’s control on the road-condition that the adrenaline was more pumping through my passengers than me J. And this probably brings me to the essence of the everlasting debate whether it is necessary to buy a 4×4 or whether 4×2 is sufficient. Since my Jetta trip I have driven a Syncro kombi, a Jeep Grand Cherokee, a Ford Ranger 2.5 4×4 and now the newer Ford Ranger 4×4 30TDCi. My finding time and again is simply that driving a 4×4 enables you that little extra, where other vehicles have to turn around, and I’m not talking serious off-roading only. I’m definitely not on about saying which 4×4 is the best, but simply that 4×4 capabilities adds an extra dimension to normal travel, where you don’t really even expect to go 4x4ing. 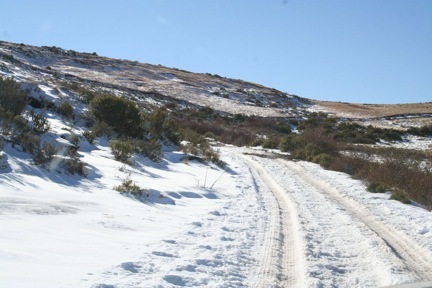 Bidstone pass is the first 5 km of the Bidstone to Tiffendell road and is a steep pass up the mountain which will be accessible to most vehicles, in good conditions. Our conditions were not extremely bad, but there was ice, snow and mud, while the gradient is sufficiently steep to create unease. I did the pass twice up and once down and every time with equal ease. 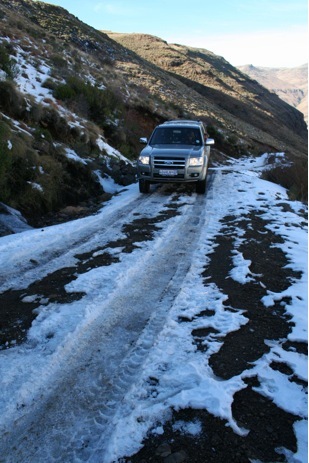 The second morning certainly soothed the 4×4 driver ego in me when two bakkies met us at the foot of the pass. They stopped and asked whether I was planning to go up the pass and when I confirmed they enquired whether my Forkie was a 4×4. There’s were not and they turned around after a few 100 meters because of the conditions. This again confirmed to me that the combination of double the traction and drive of 4×4 drive, plus the availability and control of that lowdown power which the low range gears provides plus probably the good grip in those conditions of the BF Goodrich AT tyres enabled me to idle up the pass without even once experiencing spin or slide. Coming down I also had a guy stop next to me with a 4×2 vehicle, stating they “sh&t” themselves coming down sliding while again we came down in a complete controlled low range “foot far away from clutch” fashion, not a hint of sliding. And this whole rationale above simply to state that I was able to experience one of the most stunning 20km drives I ever had. Mountains around us covered with snow, iced stalactites hanging down from the excavations on the mountain side of the road and frozen dams complementing the dramatic scenery. This is a drive that is truly recommendable for its overall scenery and driving pleasure. It was one of those long weekend trips where I have 300 plus photos to share, indicating the photogenic splendor of what we experienced, probably 2 extra kg of weight to shed, indicating Janet’s culinary skills and treats, more than a couple of letters of thanks and appreciation to write, indicating the friends made and hospitality experienced and many joyful hours of planning to do on a next trip, indicating the benchmark challenge I have set myself. Though this is merely a trip report to share a nice weekend, and by no means an advertisement paid for by some-one, I can with a clear conscience say, go visit the Wartrail, it is truly worth it. Posted on January 13, 2012 March 13, 2012 by De WetPosted in Off the beaten track, travel and stuffTagged Eastern Cape, New England, Wartrail. Dit lees so lekker soos vakansie! En nou is Tiffendell ongelukkig nie meer nie.